- Sam helps Annalise to get a box off her head. He does it and they fall to the ground, laughing. Marlene sees them from a distance. - Cody has been invited to the Orientation Week early, but they're definitely not going out. - Susan and Annalise meet Angie. She tells them Stonefish is an inspiration to the whole family. - Danni tells Stonefish that Brett is using him as a guinea pig to prove that anyone can be elected as school captain. STONIE:(pointing a finger at Brett's face) Talk, now! Stonie rants aggressively at Brett. Brett tells him that it *did* start out as an experiment, but things have changed - he and Libby have confidence in him now. STONIE:(letting go of Brett's neck) Arghhhh! You're sick, that's what you are! You're SICK! get your kicks out of some other loser, just stay out of my life! He storms out, leaving Brett looking terribly guilty. Susan and Libby are fighting over cake(!) but just then Annalise pops round. Libby teases her about Sam and Annalise explains about getting the box stuck on her head. Libby suggests she rehearses using a cardboard box instead. Brett is ranting at Danni saying she never knows when to shut up. Danni points out that Brett knew what he was doing is wrong. He tells her he'll fix it - somehow. Stonie is comfort eating a huge burger with chips when Rick comes in. Rick notices his mood. STONIE:(muttering) Schemeing little nerd, I should have flattened him! Rick realises he is talking about Brett. Stonie explains about Brett's scheme and Rick is sympathetic, saying it's very unlike Brett. After all, Brett helped out with Rick's campaign only last year. STONIE: Alessi, Brett Stark is scum, got it?! Brett has told Libby what happened with Stonefish. She is horrified and says they have to find a way to make it up to Stonie somehow. The atmosphere is a bit strained between Cody and Rick. Helen invites Rick to dinner, but he explains that Cody has other plans. Cody invites Rick to come to the "N" party. He isn't keen, but finally agrees. Cody is going either as Nancy Reagan or a nerd(!) Rick says he'll go as Napolean. When Rick has gone, Cody tells Helen that she and Rick are both going to the party, so won't be in for dinner. Libby tells Susan and Karl about the Stonefish campaign episode. They are not very impressed and tell her off for being insensitive. SUSAN: I'm very disappointed in you, Libby. Brett has told Helen about the Stonefish episode. HELEN: I must say, I'm very disappointed in you, Brett. BRETT: I know. *I'm* disappointed in me. 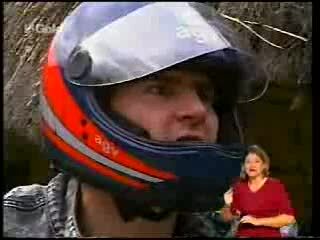 Brett berates himself and Helen advises him to apologise. Although giving Stonie back his dignity might be a little more difficult. Cody and Rick are back from the "N" party. Rick thought Cody's new mates were a little on the dull side. He thought Lec was the worst, and Simon was a bit sleazy. Cody tells Rick he was sulking in a corner(!) But she does want Rick to get on with her new mates. The weather forecast today is 38C. Brett is putting on suncream while Danni cuts up oranges. Brett is off to see Stonefish. Stonie tells Toadie crossly that he's not taking him to the beach today. But finally he says if Toadie pays for the drinks, he'll think about the beach. Brett comes in and Stonie glowers at him. He won't let Brett get a word in. STONIE: I'm not going to listen to anything you say because everything you say is bull! He storms out. Brett chases after him. Brett catches up with Stonie as he's about to ride away on his bike. He tries to apologises again, but Stonie just rides away. Helen is feeding Holly. She asks Cody how the party went. She enjoyed it, but says that Rick was in a mood. Helen says Rick probably felt threatened and out of place in Cody's "new world". Cody says he was just sulking. Brett is brooding when Libby and Susan come in, relieved to get out of the heat. Annalise tells Susan that the cardboard box is really helping. At a table, Libby suggests that Brett writes Stonie a letter. She'll help him with it. Cody makes Karl brings Karl a coffee. She tells him she's signed up for the cricket club. Karl suggests that they go down to the nets for a few hits some time. Rick comes in while Karl is telling a story of his University cricket days and rolls his eyes at the mention of the word "Uni". He heads off again. Cody explains to Karl that Rick is having trouble with her having new friends. Karl warns her to make efforts to keep her old friends. The telephone rings and Cody answers it. Rick sits down at the counter looking dejected. He tells Susan and Annalise that he's sick of Cody raving about Uni all the time. Susan suggests that he goes and has a swim to cool down. Annalise offers him the use of her pool, and Susan says she'll join him. Libby and Brett have finished their letter to Stonie. Libby goes off to join Susan and Rick for a swim. As Brett is leaving, Cody tells Brett that Stonie has an accident on his bike - and it doesn't sound too good.